It is important for us to take care of all aspects of our patients, which is why Spiritual Care services at Southeast Health ministers to your religious and spiritual needs. We offer spiritual care to anyone who comes through our doors, including patients, their families and loved ones and Southeast Health team members. Our clinically trained chaplains are grounded in a variety of religious traditions and trained to be helpful to, and respectful of, those of all faiths, as well as those who may not be comfortable with religious beliefs. Chaplains can help if you are experiencing sadness, loneliness, stress or anxiety. They can also help in the resolution of conflicts or communication issues with family or staff and support you as you work your way through new or difficult experiences and make important decisions about your health and care. 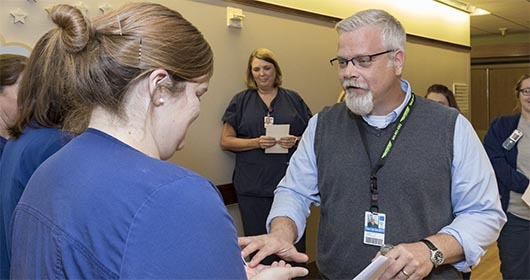 Chaplains are also available to provide for any cultural needs that you may have during your stay in the hospital and provide prayer, communion, anointing and other observances upon request. Full-time Southeast Health chaplains are board certified with the Association of Professional Chaplains (APC). This means that they have completed a master’s level degree, completed at least four units of clinical pastoral education, and are ordained and endorsed to chaplaincy by a recognized religious community. You can also ask your doctor or nurse for a referral to Spiritual Care. Recognized representatives of local religious groups and congregations provide spiritual care to patients of Southeast Health and their significant others through participation in the Spiritual Care Clergy Volunteer Program. This program is open to ministers and laypersons of any religious heritages or traditions called to provide culturally appropriate spiritual care in the hospital setting. Clergy volunteers are available to patients who request visits from a minister or spiritual caregiver. They also provide support upon request for families and community members who visit our Emergency Department. In these and other ways, clergy volunteers serve to ensure that Southeast Health patients and families always have access to spiritual support systems appropriate to their own beliefs and values. Every participant in our Clergy Volunteer Program receives orientation to Southeast Health and onsite training in basic spiritual assessment under the supervision of a board certified chaplain. If you would like more information regarding the Southeast Health Clergy Volunteer Program, please contact the office of Southeast Health Spiritual Care at 334-793-8178. Applications are available to download using the Volunteer Application link. No one is born alone, and in the best of circumstances, no one dies alone. Yet from time to time terminally ill patients come to Southeast Health who do not have family or close friends to be with them as they near the end of life. No One Dies Alone is a Spiritual Care volunteer program at Southeast Health that provides the reassuring presence of a volunteer companion to dying patients who would otherwise be alone. Companions come from every walk of life and receive orientation and training onsite in preparation for service. If you would like more information regarding the Southeast Health NODA program, please contact the office of Southeast Health Spiritual Care at 334-793-8178. Applications are available download using the Volunteer Application link. If you are interested in volunteering as a Clergy Volunteer or NODA Companion at Southeast Health, please call 334-793-8178 or download the application below. You may also deliver the completed packet to the Information Desk, located at Entrance 2.